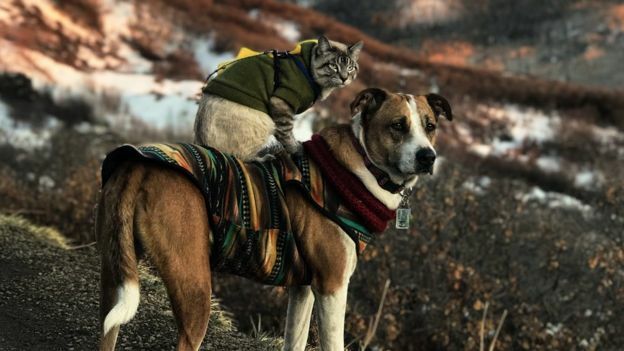 Best friends Henry and Baloo have a lot in common – they have both been rescued and now enjoy long walks in the great outdoors. 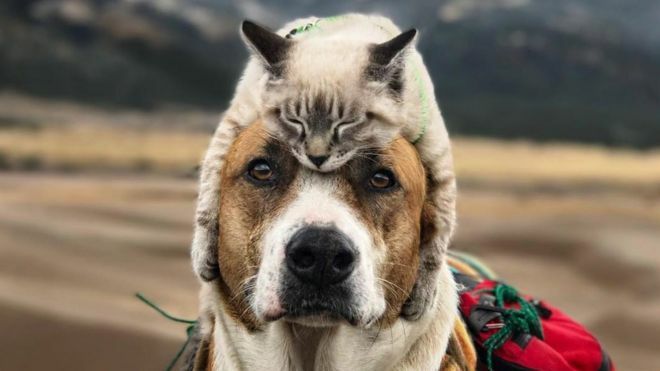 What makes them special to their many fans is that they are a dog and cat travelling duo. 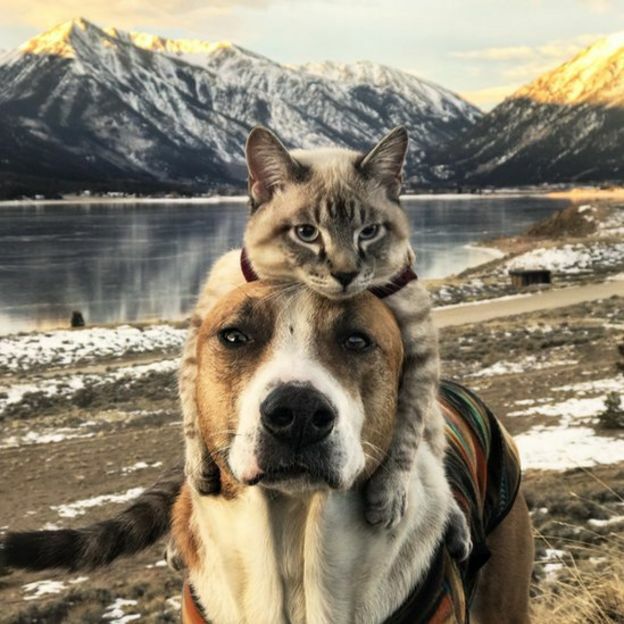 Their unlikely friendship and hiking trips around the beautiful mountainous landscapes of Colorado have gained the pair a cult social media following. Hundreds of thousands of people follow their adventures on the photo-sharing platform Instagram. For owners Cynthia Bennett and Andre Sibilsky, their popularity is surreal. Cynthia and Andre met in Boston, but as New Hampshire and Texas natives, the couple say they are both nature lovers who were destined to move away from city life. “We wanted to head west, toward bigger mountains. We came upon Colorado and moved on a whim, there wasn’t a lot of planning involved,” Cynthia told the BBC. 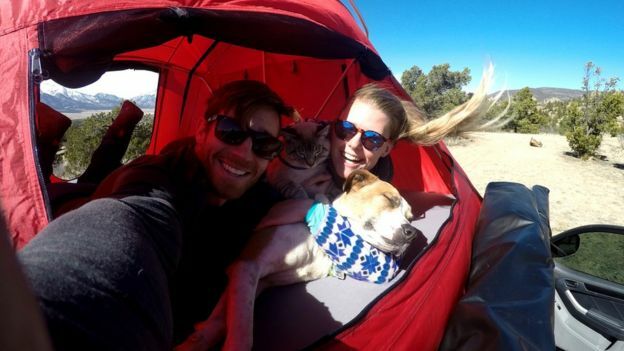 The pair started hiking regularly and once settled, decided to extend their family by adopting a dog. Henry – a tall and lanky German Shepherd, Husky, Boxer, Staffordshire Terrier and Aussie mix – stood out right away. “He was the same age as all the other puppies but twice the size. As soon as I got into the pen to see him, he crawled onto my lap and went belly up,” Cynthia explains, laughing. Cynthia’s family, she says, are dumbfounded by their popularity. Andre works a typical office job in finance, but the popularity of the Instagram account has led Cynthia to scale back on her work in event marketing and focus more on updating the account and her passion for photography. “Taking a leap as an artist is very scary and it’s not very stable in the long side of things, but I tell my followers all the time you are changing my life and allowing me to do what I love,” Cynthia says. “It’s also giving Henry and Baloo a better life, I get more time off to travel and be with them.”It is not all positive, however. Popularity has brought on some backlash against the couple’s alternative outdoor-based lifestyle, according to Cynthia. “As soon as you get well known, you get the other side – which has been different to deal with. But she says the support far outweighs the negativity. Through the social platform they have been able to connect with others, such as people in the so-called “vanlife” community, who receive similar complaints and criticism over their nomadic lifestyles.